Luckily for us, life always gives us moments to cheer about! One thing for sure is that decor is an essential ingredient for any event. Set the standards for your event and delight the eye of your guests with our vivid party kit, perfectly tailored for Teen Girl & Women, or events like 1st anniversary,14th,16th,18th,21st,30th,40th,50th birthday or any other happy celebrations you want! You may also integrate them for Disney Princess Party, Disco Theme, Tea Party, Nursery or with your existing party supplies. There is NO need to STRUGGLE when it comes to assembling the Pom Poms. In order to save your time and energy for DIY Tissue Paper Pom Poms, we created the best printed instructions for you step by step which will explain to you how to obtain that perfect Round Shape for your Pom Poms. If it's possible, enjoy this process together with your family/friends. 3 Sizes: 14", 12", 10"
One colour for each size. Ribbon included for each Pom Pom. PomPoms ships flat and becomes fluffy after assembling. 4 Colours: Lavender, Silver Glitter, Pink and Cream. 3 Packs in 3 separate colours: Purple, Silver and Pink. Length 27" for each swirl. Through our vivid kit, we want to give value to your event by helping you to obtain that kind of party you've only dreamed about, so take advantage of our offer and wake up the kid inside you by creating that spectacular atmosphere at your party! PRODUCT WARRANTY AND CUSTOMER SERVICE - If for any reason you are not completely satisfied with your purchase, simply return it within 30 days and we will refund the full amount of money. 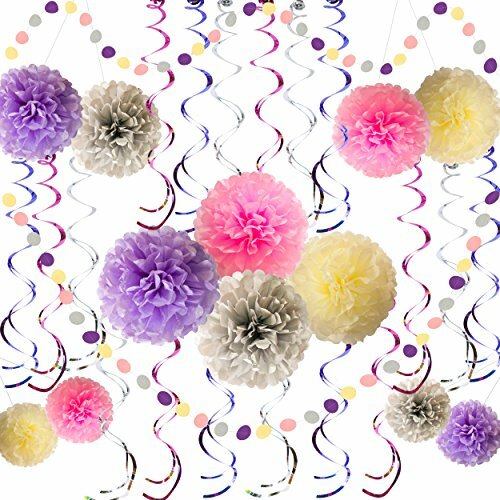 GREAT QUANTITY SET of UNIQUE DECORATIONS - 32 Pcs parties supplies including 12 Pcs of Tissue Paper Pom Poms Flowers, 18 Pcs of Sparkling Hanging Swirls and 2 packs of Circle Garlands. WIDE VARIETY OF USES such as hanging on the wall, photography backdrop, or as a table centrepiece. If you have any questions about this product by SifON, contact us by completing and submitting the form below. If you are looking for a specif part number, please include it with your message.